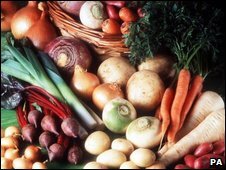 A vegetarian diet may help to protect against cancer, a UK study suggests. Analysis of data from 52,700 men and women shows that those who did not eat meat had significantly fewer cancers overall than those who did. But surprisingly, the researchers also found a higher rate of colorectal cancer - a disease linked with eating red meat - among the vegetarians. Writing in the American Journal of Clinical Nutrition the team said the findings were worth looking into. Although it is widely recommended that people eat five portions of fruit and vegetables a day to reduce their risk of cancer and other diseases, there is very little evidence looking specifically at a vegetarian diet. In the latest study, researchers looked at men and women aged 20 to 89 recruited in the UK in the 1990s. They divided participants into meat-eaters, fish-eaters, vegetarians and vegans. During follow-up there were fewer cancers than would be expected in the general population - probably because they were a healthier than average group of people. But there was a significantly lower incidence of all cancers among the fish-eaters and vegetarians compared with the meat eaters. For colorectal cancer, however that trend was reversed with vegetarians having a significantly higher incidence of the condition than the other groups. The researchers were surprised at the finding, which contradicts previous evidence linking eating lots of red meat with the disease. Study leader Professor Tim Key, a Cancer Research UK epidemiologist at the University of Oxford, said no previous study had looked at diet in this way and there had been a lot of confusion about the issue. "It's interesting - it suggests there might be some reduction in cancers in vegetarians and fish-eaters and we need to look carefully at that." He added: "It doesn't support the idea that vegetarians would have lower rates of colorectal cancer and I think it means we need to think more carefully about how meat fits into it." More work is needed to unpick the links between diet and cancer but such studies are incredibly hard to do, he said. Dr Joanne Lunn, a senior nutrition scientist at the British Nutrition Foundation, said the findings highlight the fact that cancer is a complex disease and many different lifestyle factors play a part in determining a person's risk. "An interesting observation was that the vegetarians had a higher rate of colorectal cancer than the meat-eaters. "When you look at the detail of their diets, the meat-eaters, to which the vegetarians in this group were compared, are eating only moderate amounts of meat each day - well within the recommendations. "Both groups are also just about meeting the recommendation to eat at least 5 portions of fruits and vegetables a day." Should we listen to cancer scare stories?